464) A 68 year old man with history of Diabetes Mellitus type II and diabetic gastroparesis is evaluated in your office for lack of appetite, nausea, vomiting, weight loss and a feeling full after eating small amounts of food material. He has lost 10 lbs weight in past 2 months. He denies any rectal bleeding or melena. He does report some epigastric discomfort. On examination, he appears in no distress, blood pressure is at 120/80. Abdomen is mildly distended with slight tenderness in upper abdomen. Patient is admitted and started on IV hydration. 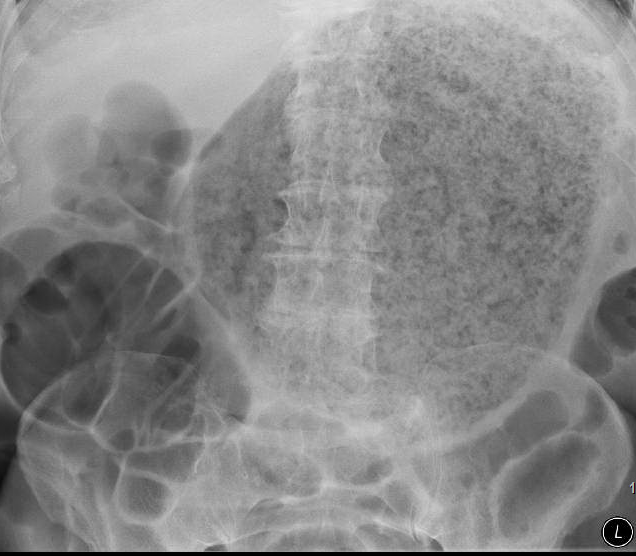 A plain X-ray abdomen is shown below. Gastroenterology is consulted and an upper endoscopy is pending. What is the most appropriate evidence-based next step? what does the x-Ray show? Knowing what’s shown in this X-Ray will help you choose the correct answer. Diabetic gastroparesis is a distractor. Is it a volvulus? Laparoscopy? Sorry I mean laparotomy ? Bezoar is correct but laparoscopy is not the first step! No kidding !! It is coca cola!!! Read about it online. Wow!! Is this because he was eating something weird or because the gastroparesis predisposed the accumulation of insoluble food stuff leading to the bezoar? so would have got this question wrong in the exam, seems like for some questions in step 3 take the most weird answer to get it right, i have never heard of a phyto gastric bezoar, what is it? ?